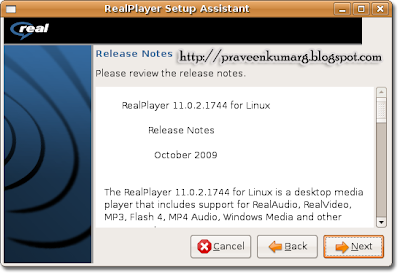 How To Install Real One Player In Ubuntu ? You are here: Home / Linux / How To Install Real One Player In Ubuntu ? RealPlayer for Linux allows you to play more video, including popular Windows Media files, RealMedia files and more.It as got a wonderful features like Personal Playlists, 5.1 Surround Sound,Controlling Live Streams. It will ask password give it. 5. It’ll start the installer. 6. It’ll ask for the install path.Just hit Enter. 7. It’ll ask for a confirmation of install path. Press F to Finish the install. 8. Within few minutes it will finish installing Real One Player 11. To launch theReal One Player,Go to Applications –> Sound & Video –> RealPlayer 11. Follow setup prompts and RealPlayer should be launched. That’s it Real one player installation is done.